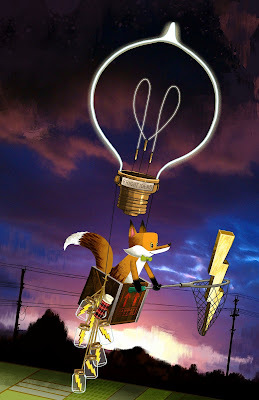 Ferguson the Fox travels the world in a giant floating light bulb fueled by bright ideas. He spends his days chasing clouds and phenomenons and adding lightning bolts to his collection. I've learned that everyone works differently. Everyone has their own routines and creative habits to get them to wherever they need to be in order to want to sit down and pour onto a page, canvas, or computer screen what's been dancing around in their heads and buried in their hearts. Some people need a shot of whiskey to loosen the screws. Some people prefer a hot cup of caffeinated salvation to activate the nerves. Some people need the perfect soundtrack playing in the background to stir the soul. And for me it’s all of these things plus scribbling down a few words onto a yellow post-it note. There's definitely something about capturing the point of inspiration as soon as it happens. For me...it’s like bottling lightning in a jar. As long as I have these few words to go back to, I can reactivate the point of inspiration when I need to. But in the meantime...all these thoughts are collected and stored away for safe keeping. At this point, it feels like I've got shelves of jars filled with lightning storms waiting to be released and that's exciting to think about. My post-it note for this piece read "chasing clouds and collecting lightning"